The new Windows 8 start screen featuring the ‘tile’ design of Windows Mobile. Each tile can also display ‘live’ information from the application. 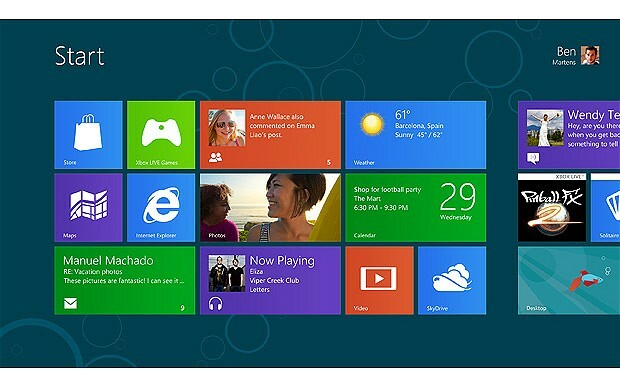 Last Wednesday saw the release of a freely-downloadable Consumer Preview of Microsoft’s upcoming operating system, Windows 8. If the move from Windows XP to Windows 7 (or Windows Vista, you poor souls) felt like a bit of a leap — at least visually — then prepare yourself for breaking an Olympic long jump record with the upgrade to Windows 8. The differences between Windows 7 and Windows 8 can be summarised in one word: unsubtle. Once Windows 8 is set up and you have logged in for the first time, you will notice the other dramatic change. The familiar task bar, start menu, and desktop have been completely replaced with a new user interface featuring a Metro-style scrolling Start screen similar to the Windows Phone operating system. Apps are represented by tiles, which can be ‘live’ and show relevant information — for example the tile for your Mail app will show your unread messages. All apps launch in full-screen, with menus hidden by default and available by right-clicking (reminiscent of Android’s menu button). The interface can be used with a mouse and keyboard, however it is clearly optimised for a touch screen, and tablets will be sold with fully functioning versions of Windows 8 installed. Hovering over the left side of the screen will show a list of recently used apps (again, similar to Android), however the familiar Alt-Tab shortcut works just as well. Hiding underneath all this however is the familiar Windows desktop, which has been included to support legacy software not available in the app store. This can be accessed from the Start screen, and will be launched automatically when accessing older apps. This means all your old applications from Windows 7 will work fine, and are not affected by the new user interface. This experience can be jarring however, and in the Consumer Preview there seem to be too many inbuilt functions such as Task Manager and Windows Explorer that fall back to the legacy desktop, rather than having new Windows 8 interfaces — this may be fixed however in future versions. Both of these changes serve a common purpose. Mobile and tablet devices are growing in popularity, and companies such as Microsoft and Apple are striving to create a seamless experience across all devices. It remains to be seen whether these changes will alienate users comfortable with more traditional operating systems, and whether the push towards App stores will make things harder for software developers.